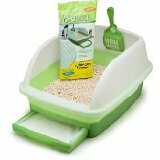 Tidy Cats Breeze Review – Find the best automatic litter box here! For years, Tidy Cats was pretty much just known for their litter. Now they’re making litter boxes too. The Tidy Cats Breeze litter box isn’t electronic or battery operated, so you won’t waste cash powering it. To use it, you slide a special tray under the box, then fill the box with dust-free litter pellets. When your cat uses the box, liquid waste falls through the bottom of the box onto the tray. The pad in the tray absorbs the liquid and controls its odor. Solid waste stays in the box, and you remove it with a scoop. You clean the tray by sliding it out, disposing of the pad, and replacing it with a fresh one. The Tidy Cats Breeze kit comes with the box, plus a pack of four pads, one bag of pellets, and one litter scoop. The box does not work with other types of litter, so you’ll need to purchase more pellets once the first bag runs out. You can get a big bag for about $8, so it’s hardly more expensive than other brands. You’ll need to change the litter completely about once a week. Because the special pellets are 99% dust free, there’s virtually no tracking or litter odor. That makes the Breeze a good choice if you or a loved one has allergies, asthma, or other breathing trouble. Amazon reviews note that the Breeze works well for two to three cats, although the manufacturer suggests that you use one box per cat. The Breeze does a decent job at masking waste odor if the box is changed as often as recommended. If the box is not cleaned regularly, though, the odor will be noticeable. Some cats may not enjoy using the new pellet-style litter. You can usually transition your cats to use the litter over time, however. 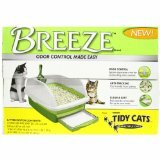 Click here to learn more or buy the Tidy Cats Breeze on Amazon. Click the video below to watch Tidy Cats Breeze in action.